This is an article this month on Parents.com that Yourorganicchild.com was a contributor for. These 30 tips make it easy to be a greener parent—on Earth Day and year round. We get it. Some days you actually feel like you’re Mother Earth and the weight of the world is on your shoulders. That’s why we came up with 30 small changes you can make that will lighten your load and your carbon footprint.From household hacks to money-saving tips to what kids should (and shouldn’t) be bringing to school, we consulted six experts—and did plenty of product-testing and soul-searching ourselves—to present you with these (totally easy!) ways to be a little bit greener as a family. 1. Cut back on red meat, which is detrimental not only to your health (it can increase the risk of heart disease, diabetes, and cancer) but to the environment as well. According to the U.N. Food and Agriculture Organization, cattle farming is responsible for 18 percent of the world’s greenhouse gases and is a major source of deforestation. Consider swapping red meat for these delicious, kid-friendly chicken or turkey recipes instead. 2. Ditch the plastic bags. 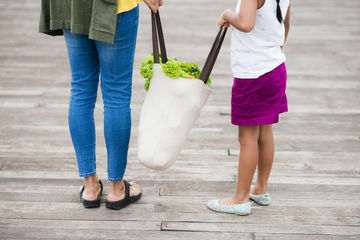 Nearly 9 million tons of plastic waste fill the oceans every year, but it’s easy to do your part to reduce that number if you keep a reusable one with you at all times—like this cute and charitable Earth Enthusiast tote from FEED or this compact grocery bag made in the USA from Maptote. 3. Plan a greener getaway. Be a family of responsible travelers by supporting small community-driven businesses wherever you go, flying with eco-friendly airlines like Jetblue and United—that make it easy to offset your trip’s carbon footprint in a few clicks!—and booking an environmentally conscious room with hospitality industry trailblazers like Kimpton and Starwood’s Element. 4. Don’t support fast fashion. Kids outgrow clothes so quickly, and given the environmental impact of making clothing, it’s more eco-friendly (and cost-conscious!) to embrace hand-me-downs and second-hand clothes. Try second-hand outdoor apparel shop Threadlyte as well as Luvmother for durable, sustainably sourced clothing that’s great for passing down to the next kid or your friend’s new baby. 6. Use a plant-derived laundry detergent free of artificial fragrances and sulfates—that’s gentle on baby’s skin and the planet, yet tough on stains—like Seventh Generation or Thieves. 7. Say bye-bye to chemical fabric softeners and dryer sheets and opt for handmade Wool Dryer Balls from Nurtured Sew Naturally, which makes long-lasting 100 percent Canadian wool balls that not only reduce static and wrinkles, but also save you money and loads of energy by cutting dryer time up to 50 percent. 8. Pack silverware and cloth napkins in your child’s lunch instead of plastic and paper. Also, opt for reusable containers (try ECOlunchbox, (re)zip, or Stasher).